The UNSW engineers are looking to claim back-to-back wins. Humanoid robots will clash in Germany. They may not be household names like Tim Cahill or David Carney, but 5 young Australians are about to make a big impact in the world of soccer. 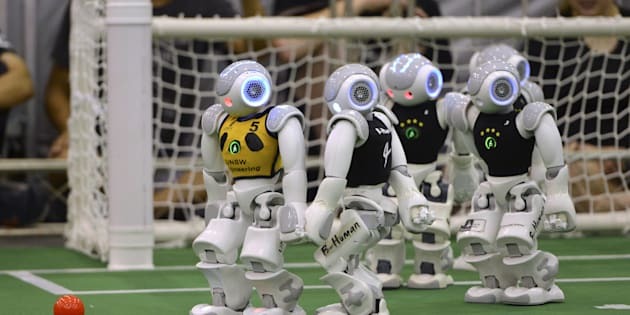 The University of New South Wales (UNSW) engineers are headed to Leipzig, Germany, to defend their RoboCup world championship title, won in 2015. UNSW said the students' 6 robots would "act completely autonomously and rely entirely on programming and self-governing algorithms developed over the past year". While the robots battle it out on the pitch, the engineers will watch the event live. Each team uses the same robots so the competition prioritises software and artificial intelligence development rather than hardware construction, the students have said previously. The uni team will be the only Aussie contingent at the competition and will battle 18 other nations, including 6 elite teams from Germany. The green-and-gold engineers admitted they would have their work cut out for them. "Our success is tied to the engineering work we've completed over the past year. There are no pep talks, we just have to make sure we're prepared – and hold our breath," computer science student Hayden Smith, 23, said. Another one of the team, Brad Hall, said Germany would be the team to beat. "We beat then last year 3-1 in the final, and the year before that 5-0 in the semi-finals. But by all accounts, they are a lot stronger this year." More on last year's world championship win can be read here.